The Reliance Controls PC3020, 20-foot, 30-Amp power cord is designed for use with manual transfer switches, transfer panel and power inlet boxes. 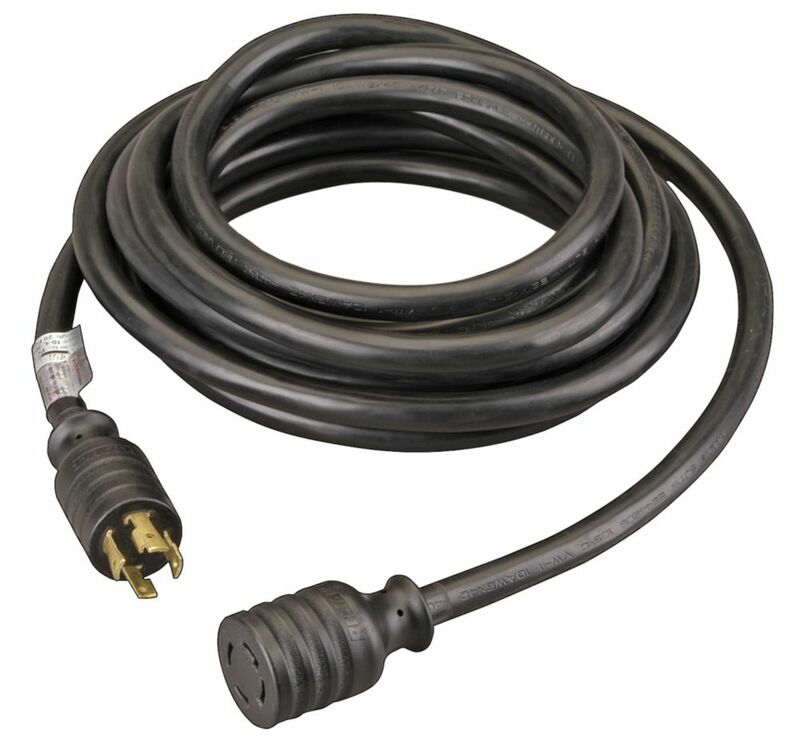 This heavy-duty power cord features 10-gauge, 4-wire with NEMA L14-30 plug and connector ends. It is North American cULus listed for use with outdoor appliances and covered by a 5-year warranty. Give your generator extra reach with the DEK Universal 25 ft. 10/4, 240 Volt Generator Extension Cord. This commercial-duty cord is compatible with L14-30 outlets. Recommended to reduce harmful voltage drops versus standard 120 Volt extension cords. This heavy duty extension cord with durable SJOW jacket provides superior resistance to abrasion and the damaging effects of oil and fuel. SJOW jackets remain more supple than SJTW jackets in colder temperatures. Also, the triple lit fantail will provide multiple outlets and serves as a power indicator. Extra heavy-duty super flexible all-weather thermoplastic elastomer cord, 50 ft. long. 3 outlet power block with lighted connector. Superior resistance to oily, moisture, ozone, cracking and are standing for abuse, rough handling and wear. Outdoor Use, the lighted connector allows to use where the power is on. Tough cord remains flexible up to 221F and down to -58F. Blue/orange cord. PC3020M 30 Amp L14-30 20 foot Generator Power Cord The Reliance Controls PC3020, 20-foot, 30-Amp power cord is designed for use with manual transfer switches, transfer panel and power inlet boxes. This heavy-duty power cord features 10-gauge, 4-wire with NEMA L14-30 plug and connector ends. It is North American cULus listed for use with outdoor appliances and covered by a 5-year warranty.